Reign over the kingdom of Israel during its golden age in Wisdom of Solomon, the upcoming strategy worker placement game by Funhill Games. In Wisdom of Solomon, players act as governors for Solomon, sending out workers to gather resources, build structures, and expand Solomon’s influence in the kingdom. The player who curries the most Favor will be crowned the winner! 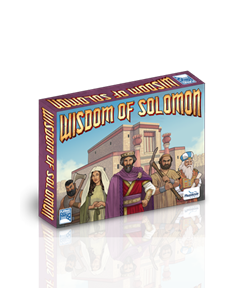 Wisdom of Solomon is a light to medium weight game, meaning that there is plenty of strategy for experienced gamers to enjoy but the game is intuitive and simple enough for new gamers to be able to jump right in. Try the game out on Tabletopia and support its future release through Kickstarter!